Easy Peach Frangipane (Peach Dartois)This is an easy and elegant dessert that can be prepared in advance for your holiday parties. Working with puff pastry makes is more versatile for those last minute finales where you want to WOW your guests. Simply delicious! Add ½ c sugar, 2 eggs and mix. 2.Roll one sheet of puff pastry and line a 11 “ x 5” pastry pan. 3.Using a spoon, spread frangipane on puff pastry. 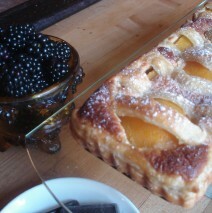 4.Pat dry the peaches and arrange on frangipane, cut side down. 5.Take the second sheet of puff pastry and fold in half lengthwise. 6.Using a knife, cut slits every ¼” from the folded side to the edge leaving one inch uncut. 7.Open folded pastry and place on top of tart. 8.Brush top of pastry with eggwash. 10.Remove from oven and allow to cool. Dust with confectioners sugar.